Doesn't these new Clarins products look just delicious? Inspired by the Rio mythical beaches, sizzling sun and the rhythms of samba new summer 2014 makeup collection is not to be missed! From this collection I got Colours of Brazil Summer Bronzing Compact and three Lip Balm Crayons which are both limited edition! 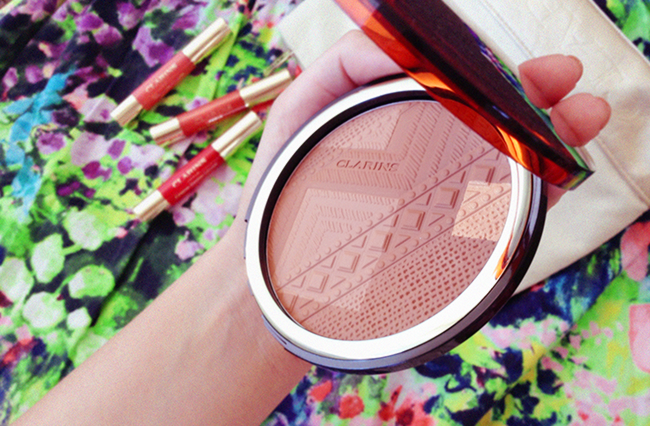 Colours of Brazil Summer Brozing Compact is probably the nicest bronzer I have ever tried! Starting with the packaging which is absolutely beautiful inside and out, it is also big and will probably last you the whole year. The color isn't too dark or orange at all - it looks indeed natural and sunkissed which I feel is so rare to find. It's a matte bronzer except that small light square at the top which is shimmery and works as a highlighter! Oh it's so pretty you can't miss out on this! Lip Balm Crayons are just as amazing as the bronzer. 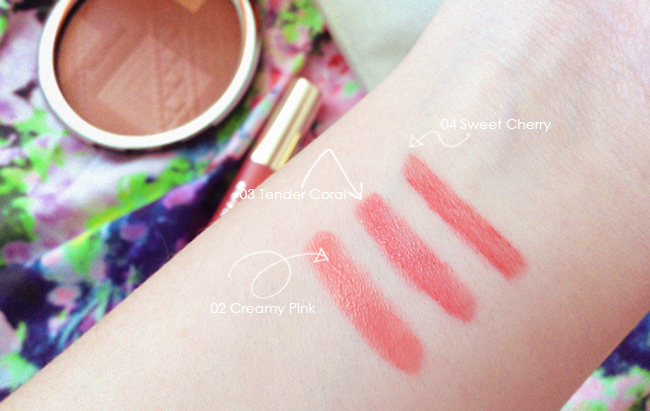 I got three colors out of six - 02 Creamy Pink, 03 Tender Coral (shimmery), 04 Sweet Cherry. The names describe the colors perfectly and they are gorgeous! Colors are quite opaque yet look very natural and give a beautiful shine to the lips. Applies very smoothly, feels creamy, moisturizing, not sticky at all and they smell ah-mazing! I think they smell like ice cream. Seriously, probably the best scented lip product ever. So far I am in love with these products. Great quality, beautiful packaging, and it feels just perfect for the effortless summer makeup look. You should definitely check out these products if you haven't already and let me know what you think! Beautiful colors! Love that creamy pink! Love the cool pattern they put on the bronzer! I like lip balm colors, nice review hun! I want them lip balms! Beautiful packaging! 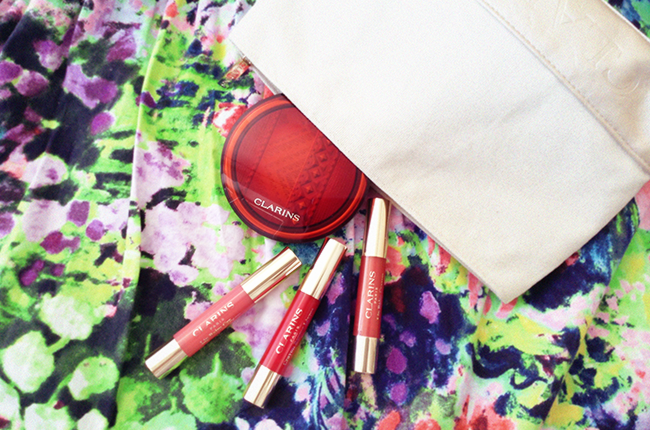 Ohhh nice...the colours are wonderful...you gotta love Clarins! These shades are so so pretty! 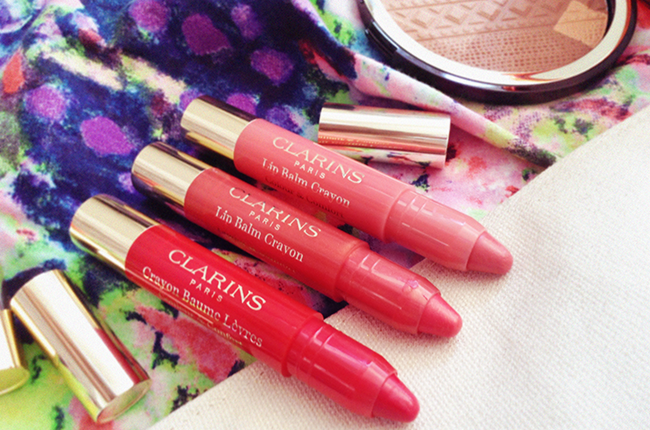 Omgggg loving the summery colours of the Clarins crayons! these lip colours look gorgeous. Wow, I love this colors! These products are looking amazing ! It looks like you discovered some amazing finds! Loving the creamy pink color! Gorgeous! These colours are perfect for summer! 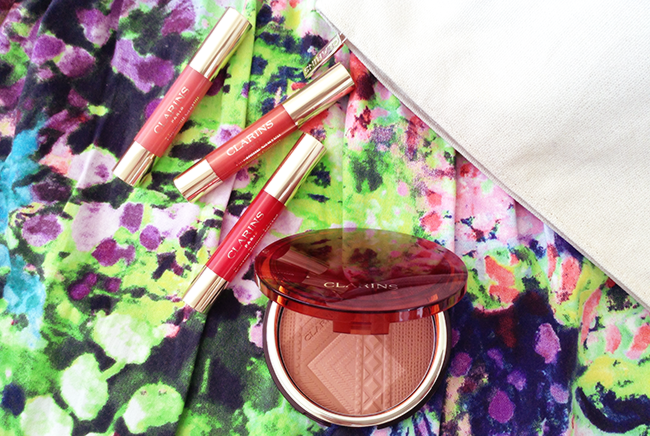 that bronzer and those lip balms look amazing! Love Clarins, but I've only used body products from them. The lip crayons look great. 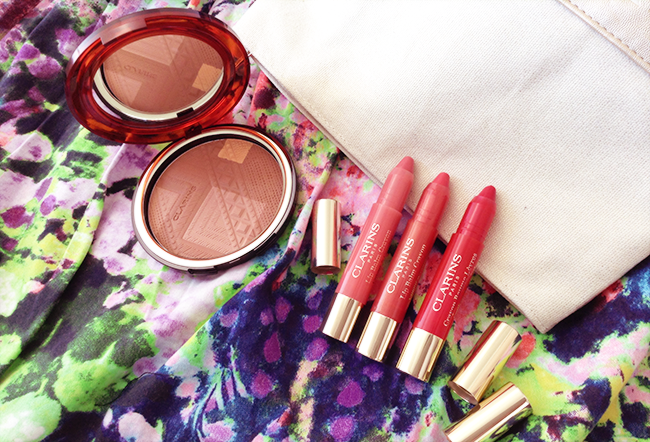 Those lip crayons are beautiful colours for summer! Love clarins! I love sheer reds for summer so I definitely want to try the sweet cherry color! And the bronzer looks gorgeous!